In the course of arranging and describing the Van Cleve-Dover Papers (MS-006, Dayton Metro Library), I learned that Benjamin Van Cleve’s Memoranda (Memoirs) apparently includes the most accurate and detailed description of General Arthur St. Clair’s defeat. I assume that Benjamin Van Cleve’s first-hand account of St. Clair’s defeat is what that person was searching for when they typed “van cleave st. clair’s defeat” into their search engine. So, whoever you are, here is a transcription of that account. Although the original in is the Van Cleve-Dover Collection, due to its age and fragility, I opted not to retrieve it for a photo-op, so all you get is the text. But do know that the original is safe and sound in the Dayton Library’s Local History collections. On the first of November the army lay I think at Still water On the second & third we marched to a Creek supposed to be the St. Mary’s but which was a branch of the Wabash We had orders to return next morning with some pack horses to assist the other line in bringing more provision. Nov 7th Notwithstanding the Indians had killed several on the road recently between Hamilton & Cincinnati I came with Joseph Stephenson & with no arms but the rifle I had brought in, to Cincinnati. On the 25th November we were discharged I received my pay, entered into the service of Elliot & Williams the new Contractors & set off the same day for the falls of Ohio to bring up a boat load of salt. The above text is from Beverly Bond’s 1922 transcription of Benjamin Van Cleve’s Memoranda. The memoirs, in their entirety, can be found online at : http://archive.org/details/memoirsofbenjami00vancrich. Additional information about Benjamin Van Cleve (1773-1821) can be found in one of my earlier blog posts [Bio Sketch: Benjamin Van Cleve, 29 May 2012], on Wikipedia [“Benjamin Van Cleve”], and of course at the Dayton Metro Library (not least of which being in the manuscripts of the Van Cleve-Dover Papers!). Thomas Dover (1829-1881) was born February 24, 1829, in a log cabin five miles north of Dayton, on the Old Troy Road (now OH-202), though the family removed to Dayton in the early spring of 1839. Thomas was the son of Henrietta Maria Van Cleve (daughter of Benjamin Van Cleve) and Samuel Best Dover; Thomas was a nephew of John W. Van Cleve, who was his mother’s brother. The other children of Samuel B. and Henrietta Van Cleve Dover were: Mary Ann Dover (1825-1903), who married Jacob Andrew Drill; Robert Best Dover (1827-1841), who died as a teenager; Henrietta Sophia Dover (1830-1911), who married Silas M. B. Simpson; Phoebe Maria Dover (1833-1876), who married Emory B. Belden; and Serah Greenham Dover (1836-1879), who married Ebenezer S. Allan. As a young man, Thomas learned the drug trade at the firm Van Cleve & Newell, with his uncle John W. Van Cleve . Thomas was with Van Cleve & Newell from 1843 until 1847, when after a bout with typhoid and a trip to Rising Sun, Indiana, he came home to find himself out of a job there. From 1851 until about 1862, Thomas worked for several druggists in Dayton, Ohio, as well as in Centerville, Indiana, and Muscatine, Iowa. He also worked with his father in the gas pipefitting business, as well as planting peach trees on his uncle John Van Cleve’s farm. 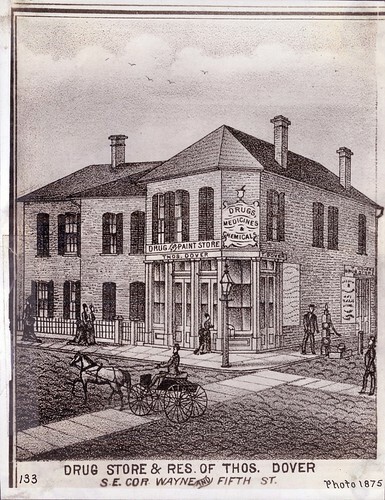 In the spring of 1862, Thomas purchased a tract of land at the corner of Fifth Street andWayne Avenue in Dayton and opened his own drug store, which he operated until his death. Thomas Dover married Louisa Jane Donavan on July 2, 1857, in Springfield, Ohio; Louisa had been born May 13, 1836, in Springfield. Thomas and Louisa had five children: Robert Fay Dover (1858-1897), who married Jennie Lehman; Samuel B. Dover (1860-1928), who married Clara Rice; Anna Maria Dover (1863-1942), who married Edwin E. McKnight; John James Dover (1865-1944), who married Bertha _____; and Harry Thomas Dover (1870-1877). 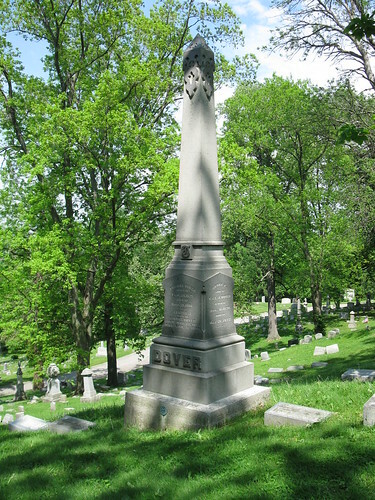 Thomas Dover died April 21, 1881, being killed instantly upon falling from a stepladder in his drug store. He was buried inWoodland Cemetery, Dayton. His wife, Louisa, died March 5, 1896, in Dayton, and was also buried in Woodland. As an addition to the finding aid, it is interesting to note that Thomas Dover’s sons were active in the Stillwater Canoe Club and can be seen in several photos of the club in the Dayton Metro Library’s photo collection. Obituary of Thomas Dover, Dayton Daily Journal, April 22, 1881, page 4. See also: Thomas Dover’s brief biography in Notebook 22 of the Van Cleve-Dover Collection. 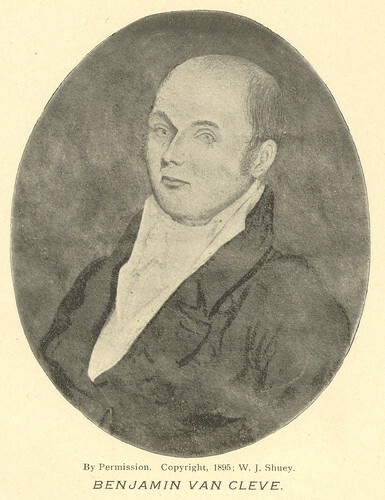 Benjamin Van Cleve (1773-1821) was one of the earliest European settlers of what would later become the city of Dayton, Ohio. He was born February 24, 1773, to John Van Cleve and Catherine Benham Van Cleve inMonmouth County, New Jersey. In December of 1789, John and Catherine Van Cleve headed west with their family, including 16-year-old Benjamin, and arrived at present-day Cincinnati on January 3, 1790. Less than two years later, on June 1, 1791, John Van Cleve was murdered by Native Americans while tending his fields. For a number of years after his father’s death, Benjamin carried the burden of supporting his mother and siblings. Benjamin Van Cleve was one of the first settlers of Dayton,Ohio, when he arrived with a small group of others at the present site of downtown Dayton on April 1, 1796. Benjamin Van Cleve’s other important roles in Dayton history include teaching at the first school in the city, being the first postmaster of Dayton, and serving as the clerk of courts for Montgomery County. He was also a surveyor. In 1805, Benjamin Van Cleve was among the founders of the first library incorporated in the state of Ohio; the library was located in Van Cleve’s log house in Dayton. Benjamin himself wrote down his memoirs in his Memoranda, which contains, among other things, the most accurate and detailed description of General Arthur St. Clair’s defeat and the only reliable account of the settlement of Dayton in 1796. On August 28, 1800, in Dayton, Benjamin married Mary Whitten, who was born February 17, 1782. 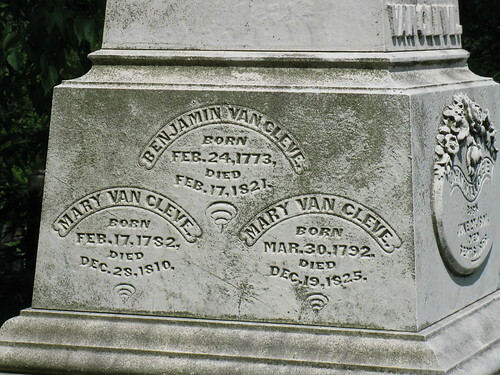 Benjamin Van Cleve had five children with his first wife, Mary Whitten Van Cleve; she died on December 28, 1810. On March 10, 1812, Benjamin married Mary Tamplin, by whom he had no children. Benjamin died on November 29, 1821; his second wife Mary died in 1825 or 1826. 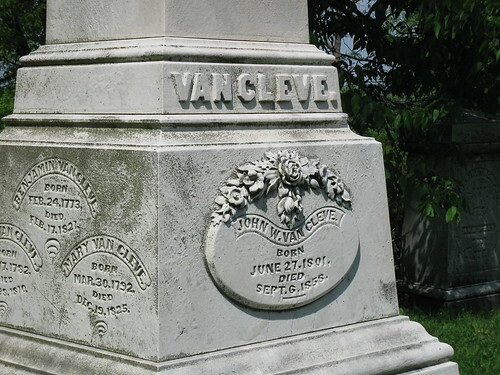 The remains of Benjamin Van Cleve and both of his wives were interred in their final resting place in Woodland Cemetery, Dayton, on February 29, 1844. The five children of Benjamin Van Cleve and Mary Whitten Van Cleve were: John Whitten Van Cleve (1801-1858), who was unmarried; William James Van Cleve (1803-1808); Henrietta Maria Van Cleve (1805-1879), who married Samuel Best Dover and later married Joseph Bond; Mary Cornelia Van Cleve (1807-1878), who married James Andrews; and Sarah Sophie Van Cleve (1809-1839), who married David C. Baker.